In the small town of Nahunta, Georgia, Secretary of State and Republican candidate for governor, Brian Kemp, drove his campaign bus to a lunchtime rally. As the bus came to a stop in front of Shane’s Kitchen, supporters gathered to shake hands and take selfies with their candidate. Kemp was welcomed with applause as he walked into the crowded restaurant. This is one of three stops for the day, and one of 17 stops in a three-day bus tour two weeks before election day. Kemp addressed the crowd about the importance of this election. Kemp and his supporters want to stop “the blue wave” that Democrats hope will sweep the Peach State. Georgia’s governor’s race has been polarizing, a liberal African American woman, Stacey Abrams vs.a traditional conservative candidate. Ryan Mohoney, 35, the communications director for the Kemp campaign said he supports Kemp because they focus on the same values: faith, family, honesty, staying true to their roots and being someone that can counted on. But he does not find those values in Kemp’s opponent. Abrams is the first African-American to be elected by a major party to run for governor. If elected, she will be the first female, African-American governor in the United States. Abrams’ platform includes expanding Medicaid, supporting women’s rights and healthcare, and creating affordable housing across diverse communities. She has also proposed to expand the Hope Scholarship (a state funded merit-based college scholarship) to create a greater opportunity for more people to get a higher education. 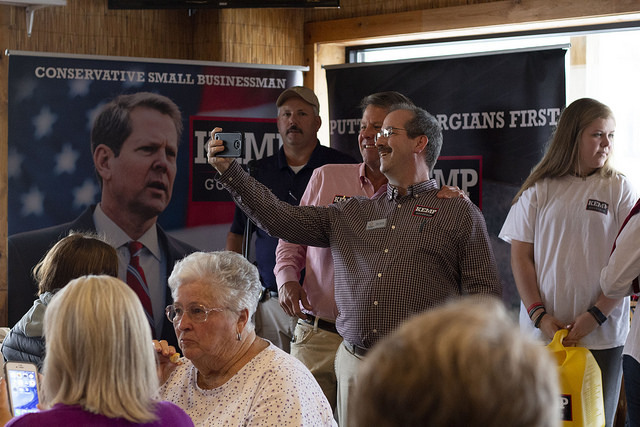 Many of Kemp’s supporters believe her values would be detrimental to traditional America. Casey Martin, 31, said that she values low taxes and she does not like the expansion of government or Medicaid. In his rally speech, Kemp said that voting for him would send a message to those that support the blue wave. Mark Williams, 48, said he liked Kemp because he is pro-life, pro Second Amendment, pro small government, and an advocate for lower taxes. Although this aligns with the national Republican platform, Williams does not compare Kemp and Trump. Other supporters are more interested in one or two specific issues. Kathy Hendricks, 58, has religious reasons to back the pro-life platform. Lisa Spurlock, 51, is running for mayor of Nahunta. She wants to see the economy grow specifically in rural south Georgia. Jimmy Spurlock, 51, agreed with his wife on economic issues and likes where Georgia is already as a red state. As Kemp continued in his rally speech, he mentioned healthcare, the Hope Scholarship, school safety, and business expansion. But he came back several times to the theme of fighting for conservative values against “socialist billionaires” in other states. In an interview, Kemp said that he recognized how his campaign is part of a bigger narrative about the country’s approval or disapproval of President Trump.